Click on the picture for more pics & details. I think this is the best buy I have on my website; and with a few of you that have been taking lessons, I'm betting it won't last very long. Yes, we can finish your training in this aircraft for an hourly discount and you'll get used to the aircraft as well. 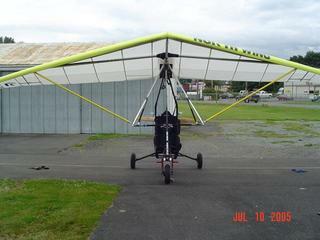 This is a local trike owned by a former Rotax/Bombardier Mechanic & Private Pilot in Seattle. This trike is perfect and I can't find anything wrong other than 3 drops of bird poop on the wing. The pictures were taken in July, and it has been in storage since August 2005. His motivation is that he's purchased a home and needs a bit more cash to close it. And, his logic is simple; he's betting his new home will increase in value quick enough to validate selling his trike at a loss; then turn around with a home equity loan and buy another one. Here are the specifications: 80 hours total time, Rotax 503dcdi, although a full electrical system has been installed (harness, reg/rect, battery & fuse block) it is still a pull-start (e-start kit: $600), wood 2-blade Tennesse prop, stored in hangar, dual strobe lights and dual landing lights, VHF radio, full communications & press-to-talk, BRS-900, full analog instrumentation, extra safety cable in front strut, intructional foot steering, instructional wing steering, black & yellow 17.5 strutted mustang-2 wing with yellow streamlined struts, std tires (upgrade to sand tires: $100), INCLUDES A TRAILER, x-country gear bags... Need I say more? Location: Western Washington. Full Crating & Nationwide Shipping Available for around $1000. We have a few other wings available too if you're looking for something specific. I also have a full Red Apache Sport fairing package available for around $2000.